Gold prices reached the highest level in two years the Friday following Britain’s decision to depart from the European Union – and it sent investors flooding into an investing frenzy to get a piece of the action. The precious metal rose in value as high as 8.1% intra day to close to $1,360 an ounce; that’s the highest gold has been valued at since March of 2014. This immense rise in the price of gold illustrates that there is a big panic sweeping through the financial markets, and it was really set off by the Brexit, short for British Exit. Because the price of gold will continue to rise as markets pull back and investor worry spreads, you probably want to get in on the investing action. Keep in mind that the US Stock market is nearing the end of a bull cycle as well. How can you do that? Here are some tips that will help you invest in gold wisely during this incredible high. Britannias or Lunars, are an excellent option to invest in. They can be bought through the Royal Mint. The most commonly purchased coins, Sovereigns and Britannias are made with a specific amount of gold. The Sovereign is at .2354 of a Troy ounces, and the Britannia is a full Troy Once. As a buyer, you should consider checking the market prices to see how much above that you are going to pay before making an investment in gold coins. There are other gold coin options to consider investing in, such as the US Buffalo, which can be purchased through several dealers, including Gramercy Gold (only if you want the best price). Bullion coins are usually made to a less than perfect finish than the special edition coins that are made specifically for collectors. This means that the prices tracks are more directly related to the value of the gold that they contain. This is important because you will not pay a premium. If you melted the gold down, you would get the same market value at sale. Special edition coins are speculative and many investors never recover the value of their purchase, and would not get the equivalent value back if they melted the coin. As a gold investor, and not a coin expert, you are looking for an efficient way to hold gold which is also easy to transport. Remember, gold is heavy. Each gold bar weighs over 27 pounds! Gold bars are another excellent option to invest in if you want to invest in gold. You can purchase gold bars through the Royal Mint, or here at Gramercy, for a price that is as low as 20 pounds (about $26 dollars) for a very small bar. There is not really any advantage or disadvantage to using bars over coins. It really is a matter of preference. Some people think coins will be better in an economic collapse. Coins also may appreciate in value if they are a rare strike. Bars are typically more practical and can contain much more gold per bar than a coin. It is important to note that it can be less expensive to purchase the same amount of quality of physical gold from us at Gramercy than buying at the Royal Mint. Why? – Because the Royal Mint also distributes its gold bullion through other brokers like us, and they do not want to drive them out of business. A great way to invest in gold is to use what is called a gold IRA. A gold IRA works by you taking the value of your current retirement account, and investing it in physical gold. You are actually allowed to do this through certain dealers like Gramercy Gold, and the gold remains held in the retirement account, avoiding any taxes. You can roll any retirement account into a gold IRA such as a 401(k), an existing IRA, a KEOGH, or 403b. You also are not required to roll the full amount of your retirement account over, but dealers normally do have minimums to hold an account. At Gramercy we will roll any account over $10,000. You need to make sure that you are doing it through a sanctioned dealer because we need special licensing with the SEC to do it legally and tax free. For a long term investment this is probably the best recommendation we can make for taking a portion of your assets and investing them in gold. These shares of gold are similar to funds. They track an index or aim to replicate the performance of an asset. They can be purchased and sold through stockbrokers or investment brokers, just like any other share. One of the most popular options is the ETF Securities’ Gold Bullion Securities, which has an annual charge of .49 percent. Another popular option is iShares Physical Gold, which is a cheaper option that costs just .25 percent. 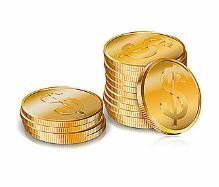 It is important to note that different funds may differ in the way that they track the price of gold. Some purchase physical gold, while others use futures, swaps, and derivative contracts. Our preference is always to use funds that use physical gold. While gold funds are a great way to invest, they do not offer the security of actually holding your own physical gold, so keep this in mind. If you think you may actually need to take your gold into your own possession (for instance if banks fail), a gold fund is not for you. Yet another option for investing in gold is a unit trust, which is run by a fund manager who invests in both bullion and gold mining companies. This gold investment has proven to be quite lucrative for some of the most highly regarded investors. You do need to be careful because while some managers strike gold (no pun intended) others make poor investment choices and strike out. A unit trust should roughly reflect price fluctuations in the metal, but they are not guaranteed. Britex has been thought to be extremely troubling for the financial world; however, with wise investing – especially in gold – you can stand to make a very good sum of money. In fact, some might even consider Britex to be one of the best things to happen to the world of investing, particularly gold. Remember to invest wisely and you could have the potential to make a great deal of money in this market.